Everything about Genesis P-Orridge fascinated me from a young age: hearing Throbbing Gristle's 20 Jazz Funk Greats thanks to my sister, finding Psychic TV's The Magickal Mystery D Tour EP at a used record store in Kansas, learning about Genesis' and Lady Jaye's gender transformations, seeing an exhibit of their photography at the Contemporary Art Museum St. Louis, and so on. However, Throbbing Gristle disintegrated a few years ago, Psychic TV hasn't toured as much in recent history, and Genesis' health has not been particularly good lately. Opportunities to see them or the band are probably quite limited. Opening the night were Lithuanian visual artist and vocalist Shaltmira and British musician and Current 93 member Michael Cashmore. In addition to singing and chanting, Shaltmira danced, played with masks, and performed various ritualistic actions. Cashmore mostly stayed behind a table with a laptop and some electronics and produced a dark electronic soundscape. Twice he stepped to the front of the stage to briefly sing along with Shaltmira. The music had elements of techno, industrial, and darkwave. This was matched with a weird, dark, magic-oriented visual display designed by Shaltmira. It made for quite a strange experience, one that I wasn't sure how to connect with. It didn't speak to me, but I found their dedication to some version of magical ritual to be captivating. The more cohesive musical elements had some appeal to me, but much of it felt purposeless and vague. 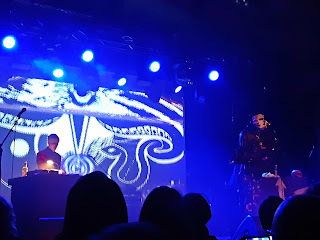 Psychic TV hit the stage at an uneven time while the house music was still playing, suggesting that they were either late or in a hurry to get going. Genesis P-Orridge came last and took the central spot. 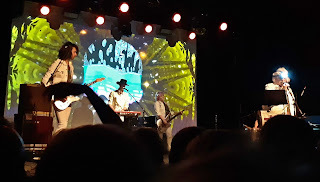 The rest of the band consisted of longtime members Edward O'Dowd and Alice Genese on drums and bass, respectively, Jeff Berner on guitar, and John Weingarten on keyboards. They started with a long instrumental passage before Genesis joined in with their vocals. Musically, the band incorporated elements of psychedelia and classic rock, but stretched out into long jams that felt trance-like and droning. They performed only ten songs over the course of almost two hours. The songs rarely felt tiresome, perhaps because of the energy of the performers, the subtle variations in the musical and lyrical themes, or the weird kaleidoscopic patterns of the slideshow, which exhibited an obsession with twisting classical art images into unusual forms in constant motion. Many of Genesis' lyrics seemed to related to their explorations and experiences with gender and sexuality. The ghost of the departed Lady Jaye was frequently present, either via their shared pandrogeny or Genesis' tribute to and obvious sadness for her passing. Another dominant theme was finding personal freedom. While I found Genesis' lyrics poignant, their vocals were not at their best. Whatever the cause, Genesis frequently sang jarringly off-key and sometimes even out of time. If I hadn't been particularly interested in understanding their experience, and if the music hadn't been strong enough behind them, the vocals might've been overwhelmingly distracting. However, there were a few shorter numbers where Genesis seemed slightly more lively and consciously engaged, such as the pseudo-Christmas song "White Nights". I missed the psychedelic reverb and other effects that often grace the vocals on their studio recordings, but Genesis' trademark unconcerned drawl was still quite present. Their humor and openness were also on display. At one point, Genesis urged the audience to reject coolness and hug one's neighbors. Between many songs, the band played samples from old movies, PSAs, and similar media, including the famous Bill Clinton denial quote. Genesis often mimed to them or made a quick joke as the next song began. Psychic TV might be a profoundly strange band, but they are also profoundly fascinating. The music was compelling, the visual aspect was hard to stop watching, and Genesis barely has to try to still have a captivating stage presence. I just hope this isn't the end of Psychic TV as a live unit. O'Dowd had to appeal twice to the crowd to stop smoking cigarettes, as Genesis was apparently on oxygen before the show and would be again immediately afterwards. They're either dedicated to their craft or desperate for financial support. I hope it's the former.